Contemporary British Silversmiths is delighted to announce it has been invited by the Victoria and Albert Museum to create a display to complement its much anticipated major exhibition, British Design 1948-2012: Innovation in the Modern Age. Part of the V&A’s British Design Season, this display represents the state of the art in contemporary silverware. 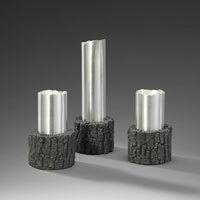 Fifty-two established and up-and-coming silversmiths from around the UK have created unique work on the theme of Fit for Purpose: a practical and conceptual exploration of silver. The exhibition is housed within the Museum’s Silver Galleries and is supported by the Goldsmiths’ Company. Images from right to left: Kevin Grey, Olivia Lowe, Peter Musson. Photographer: Clarissa Bruce. In addition, all work bears the new Diamond Jubilee commemorative hallmark which will be struck only during 2012, alongside the 2012 UK hallmark, making these objects historically significant and collectable. The exhibition takes an imaginative look at the idea of ‘Fit for Purpose’. Each objects’ function is explored through the medium of silver, both practical and conceptual, with each piece described by its purpose. 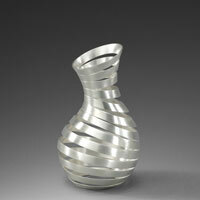 The display includes work by some of the best practising British silversmiths today. Exhibiting alongside established members of the association, many of whom are represented in national collections, 13 new graduates will be displaying their work in this showcase of contemporary design. 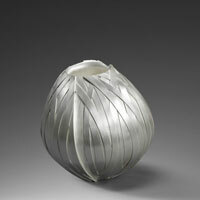 Contemporary British Silversmiths has long supported the next generation of silversmiths through its mentoring scheme. Upon joining, new graduate members are offered a mentor as their first point of contact and are actively encouraged to seek new skills by consulting with other members on either a one-to-one workshop basis or via telephone or email contact. Abigail Brown, Clive Burr, Stuart Cairns, Stella Campion, Julie Chamberlain, Angela Cork, Rebecca de Quin, Howard Fenn, Richard Fox, Wally Gilbert, Karina Gill, Rajesh Gogna, Kevin Grey, Charles Hall, Miriam Hanid, Jacqueline Harold, Rauni Higson, Kathryn Hinton, Esther Lord, Olivia Lowe, Caroline Lytton, Helen Marriott, Shona Marsh, Alistair McCallum, Roger Millar, Cara Murphy, Peter Musson, Brett Payne, Don Porritt, Martyn Pugh, Alex Ramsay, Pamela Rawnsley, Jacqueline Scholes, Mary Ann Simmons, Lucian Taylor, Stefan Tooke, Keith Tyssen, Frances Julie Whitelaw, Brian Williamson. Victoria Coleman, Jemma Daniels, James Dougall, Laura Golborne, Shaun Grace, Rebecca Hill, Phil Jordan, Martin Keane, Samantha Moore, Louise Mary, Ben Ryan, Eve Claire Taylor, Hazel Thorn.